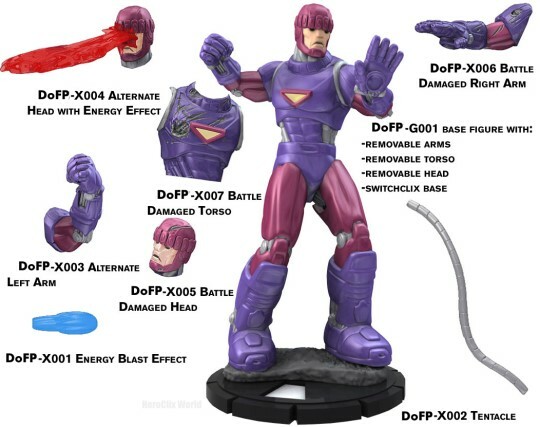 The figure used for this unit is a Heroclix figure from the X-Men: Days of Future Past Alpha Class Sentinel Scenario set. Its name is Alpha Class Sentinel. Character Bio - In a dark, possible future, the world lies in ruins beneath the paws of Beast, possessed by the sentient bacterium Sublime. 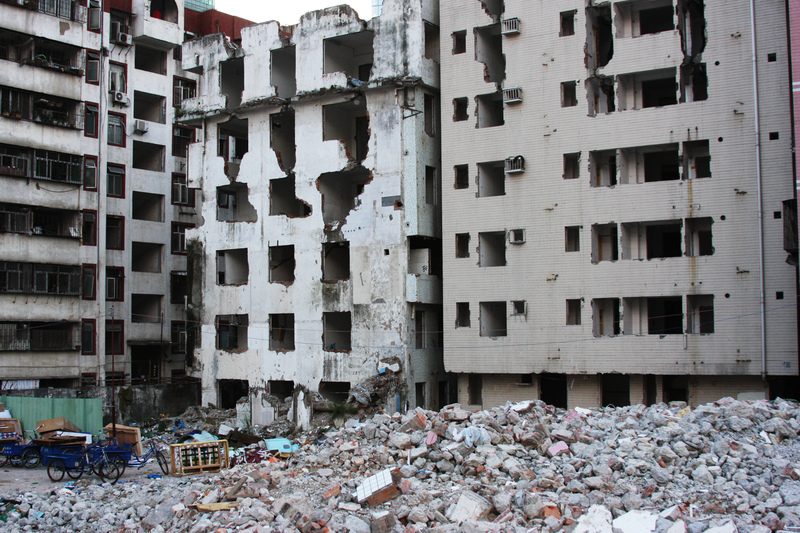 Mutantkind and humankind both stand at the edge of extinction. In a last attempt to stave off death, Rover and his ally, Tom Skylark, join with the remaining X-Men to thwart Beast's plans. Though extensive damage prevents him from saying anything other than the word "Destroy! ", Rover has long since surpassed the capabilities of his fellow early-model Sentinels and developed both a form of sentience and an unwavering loyalty to his friend Tom. Rover would be willing to give his life for Tom's, and the coming battle for the fate of the world may demand that of him. As an Android, Rover has these Android Synergies. As a Protector, Rover has these Protector Synergies. 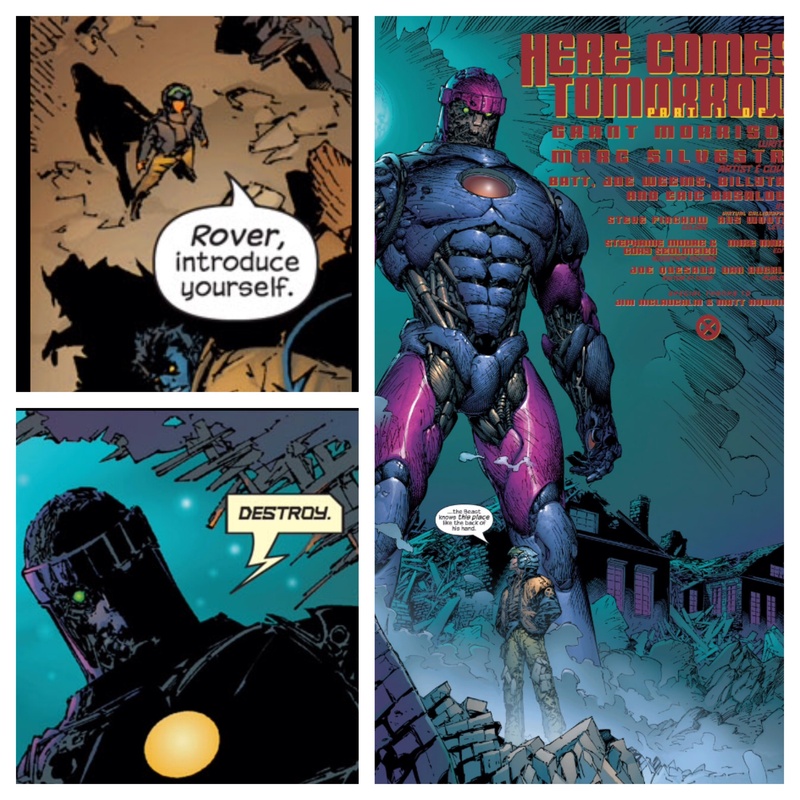 Rover may choose a Unique Human Hero or Unique Mutant Hero for his Sentinel Companion special power. Current Unique Human Heroes and Unique Mutant Heroes. Rover may use his Destroy! special power to take wounds in place of an adjacent Mutant. Current Mutants. Last edited by Ronin; May 2nd, 2018 at 10:26 PM. At the start of the game, you may choose a Unique Human Hero or Unique Mutant Hero you control to be Rover's Companion. After revealing an Order Marker on the chosen Companion's card and instead of taking a turn with that figure, you may take an immediate turn with Rover, and you may not take any additional turns with other figures you control. During this turn, Rover rolls 1 additional die when attacking a figure adjacent to his Companion. When Rover is adjacent to his Companion or a Mutant figure who would receive one or more wounds from an attack, Rover must receive those wounds instead. If he does, and the attacking figure is within 4 clear sight spaces of Rover, the attacking figure receives one wound, even if Rover would be destroyed by those wounds. Before moving Rover, you may choose an unengaged friendly small or medium figure adjacent to Rover. After you move Rover, place the chosen figure adjacent to Rover. *changed Sentinel Companion to "instead of taking a turn"
Last edited by TrollBrute; October 20th, 2016 at 10:01 PM. DESTROY! The surprising winner of the public contest, it's Rover! For those who don't know him (c'mon, he was in 4 whole issues! 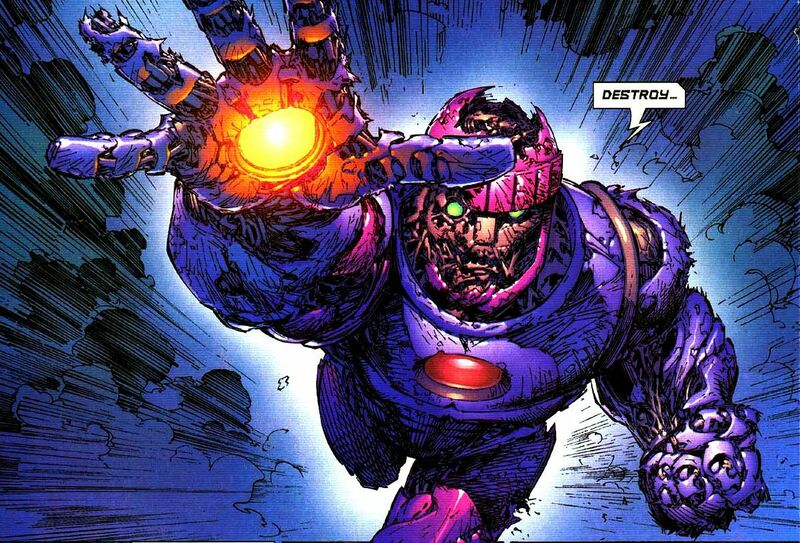 ), he's a Sentinel from the future that no longer hunts Mutants and instead protects them. He and his owner/master/companion, Tom Skylark, join the future X-Men in the fight against a possessed, evil, Beast. Partially damaged, Rover can only say the word "destroy." There is also a similar character in the Marvel series Sentinel, and a version of Rover appeared in a couple episodes of the Wolverine and the X-Men cartoon. This one's going old school in that it hasn't been workshopped much at all, and not for a long time. This is one of my oldest write-ups and it could use some work. I have some ideas of changes I want to make, but because this is the public vote winner, I thought I'd leave it open for suggestions at first. The only thing I'm set on is a power named DESTROY. Beyond the design, there's also the question of miniature. Like the standard Sentinel designs, customs are highly encouraged but we'll need an official figure. My preference is for the Alpha Class Sentinel from the Heroclix Days of Future Past set (picture below), and I'll probably try to get my hands on one. However, availability seems low, are we okay with that as the official figure? Last edited by TrollBrute; October 19th, 2016 at 08:46 PM. I like the overall feel of the design thus far. I'm interested in what changes you're pondering. Anytime an opponent's figure within 4 clear sight spaces of Rover targets a non-adjacent Mutant you control for an attack, you may place Rover adjacent to the attacking figure and roll a number of unblockable attack dice equal to Rover's remaining Life. If the attacking figure is not destroyed, it must then attack Rover. My only real concern, at first glance, is that his "master" Tom Skylark isn't a Mutant, and is thus unable to be (hypothetically) protected by DESTROY!. That being said, that sort of power could easily be on Skylark's card, as he doesn't really have much else to offer. So it's probably best to keep with the clear theme of "mutant hunter that now protects mutants." The constant moving and blocking of attacks might get finnicky, but I dunno, so far is seems like a solid writeup to me. Curious to see what other ideas people may have. Do you want him to be carrying two figures when he moves to protect a mutant? Love the design, really looking forward to this one. For the powers, that basic ideas of the two you have I think is on the mark, though I like Q's take on Destroy! better. Also minor thing, you have it called Double Carry, but in the power text you refer to it as Sentinel Carry. Given how easy it is to substitute in other Sentinel options, I think low availability should be okay. I like quozl's direction on Destroy. Like johnny says, any Skylark/Juston synergy could just be handled on their cards, but I like the idea of having a keyword power on Rover's card that could give Juston and Skylark something to key in on and base their synergy on. At the start of the game, choose a Unique Human Hero you control to be Rover's Companion. Rover rolls an additional die when attacking a figure adjacent to his Companion with a normal attack. Anytime an opponent's figure within 4 clear sight spaces of Rover targets Rover's Companion or a non-adjacent Mutant you control for an attack, you may place Rover adjacent to the attacking figure and roll a number of unblockable attack dice equal to Rover's remaining Life. If the attacking figure is not destroyed, it must then attack Rover. I also highly doubt we'll ever do a Tom Skylark design, given that he doesn't have a mini, will probably never get one, and there's hardly any call for him to be designed. To keep things balanced, I'd prefer to stick to a faction (Mutants) and on the off chance Skylark is ever designed, we can put synergy with Rover on his card. Nope. Which is why I have the standard Carry wording here, which prevents him using the power outside of his normal movement. Also minor thing, you have it called Double Carry, but in the power text you refer to it as Sentinel Carry. Like I said, it's an old write-up. I wouldn't spring for it with what's currently in the SP, but if we're doing a shorter version of Destroy, something like quozl's got, I could see a short first power that lets Rover pick a Human companion. At the start of the game, you may choose a Unique Mutant Hero you control to be Rover's Companion. Rover rolls an additional die when attacking a figure adjacent to his Companion with a normal attack. he does, and the attacking figure is within 4 clear sight spaces of Rover, the attacking figure receives one wound. When Rover uses Destroy, he will take any leaving engagement attacks. We could always give Rover bonding with the chosen figure as well, if we wanted to tie them closer together. In that case, I'd probably drop the attack boost and make Destroy only trigger on adjacency. What about something like Hawkeye II power..
After revealing an Order Marker on this card, moving normally with Rover and placing the carried figures, instead of attacking with Rover, you may take a turn (or just an attack) with one carried figure. After revealing an Order Marker on this card, moving normally with Rover and placing the carried figures, instead of attacking with Rover, you may take a turn (or just and attack) with one carried figure. That would give him too much value as an OM manager and wind up the centerpiece of the card. And it would be weird for Rover to be your tactician/leadership guy.